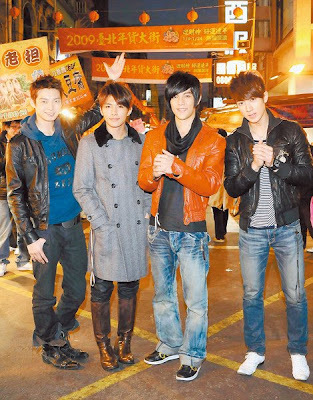 Fahrenheit took time out of their busy schedules and headed towards the large New Year goods street to purchase their New Year goods. Their eyes all sparkled when they saw that the street was filled with lots of good food. Aaron couldn't stop purchasing just 娃娃酥 (1) and took home a large amount of candy, becoming the biggest spender. 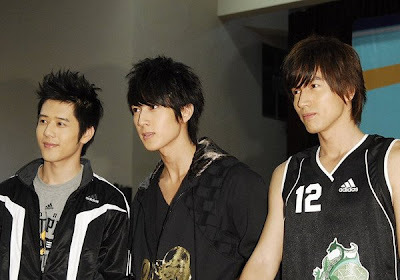 On the contrary, Wu Chun who loves to eat, was unexpectedly very controlled, buying the least out of the four members. Only spending $NT300, he said with embarrassment, "The luggage I'm taking back to Brunei is already over the weight limit so I can't fit anymore." 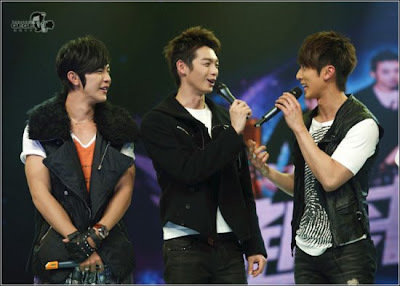 When Fahrenheit all went to Di Hua Street [迪化街], they were immediately surrounded by fans and shopkeepers. Shopkeepers took the initiative to load them with more food and make discounts. As a result, Calvin was given a large amount of free pickled plum candy. The four of them spent a lot fo money with Aaron, Chun and Calvin mainly buying food. Jiro Wang [Da Dong] on the other hand, was extremely happy when he saw a New Year scrolls store. In one go, he grabbed a stack of "Spring" [春], "Good Fortune" [福] as well as other scrolls, hoping to decorate the house with them. He didn't expect that in the midst of the rush, he forgot to take them. He had no choice but to say, "I'll just have to find a day to shop here again with my mother." When talking about foods that must be eaten during the New Year celebrations, Jiro Wang first recommends fried new year cake (2), "Because I usually have to look after my throat, I can't eat it and only break this rule during New Year. 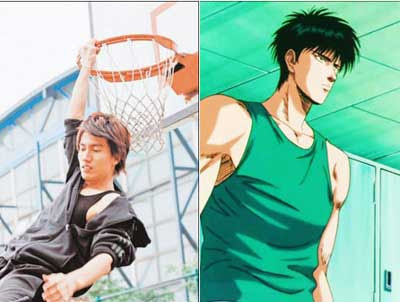 I can eat it everyday, at every meal - one year I ate so much that the heat gave me a nosebleed" Wu Chun also supports new year cake; his personal secret recipe is adding a slice of taro and frying with the new year cake. He drooled as he said this: "I really want to eat it!" 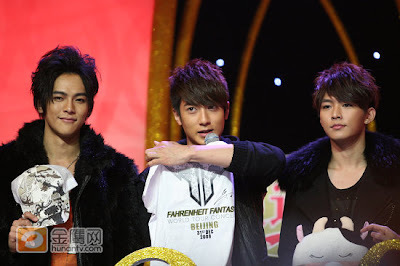 This year, Fahrenheit has achieved good results in advertisements, concerts and dramas. 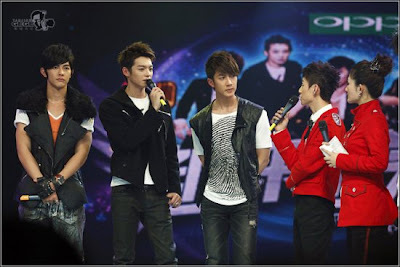 Da Dong, Aaron and Calvin will show filial respect and give their parents red packets of 6-digit figures and above. However, because in Brunei unmarried people aren't supposed to give out red packets, Chun will not be giving his father one but has prepared red packets for his gym workers and this figure will be over 6 digits. (2) New year cake [炸年糕] is a type of cake made from steamed glutinous rice. On the latest issue of Ming Pao Weekly No. 2071. Butterfly Lovers staring Charlene and Chun are soon to be release on September 11th, and Charlene's next project is with Show Lou, <>. 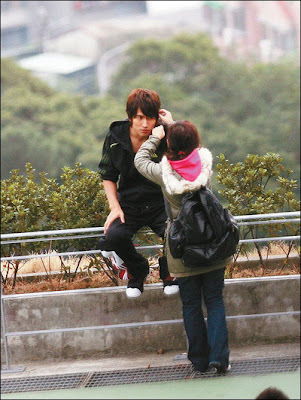 Having very good chemsitry and well liked by the media, Chun and Charlene have had rumors since their first meeting. Seeing how good they are together, Charlene mentioned in the article, Chun's manager tries to play the match maker by putting them in another collaboration, a idol serie/drama. Charlene said that she is 25, not that young anymore if she is to make idol drama it is about time. She said she is afraid if she wait any longer she is too old. When talking about the plot of the possible idol serie, Charlene said she doesn't want the idol drama to be regular dramas focusing alot on mushy love, pet love, etc. Charlene said since Chun and herself love to eat, she wants it to have a cooking theme. If possible have lots of food from all over the place, and being able to taste them all while filming. Also saying, Chun will probably be the happiest one. She jokingly mentioned a storyline like this to Chun's manager: Herself is a cook representating Hong Kong and Chun is a cook representing Taiwan [note: not necessary a cook, but someone good with food]. They both start out hating eachother, not on good terms. However, they both run into a competitor and so Chun and Charlene teams up to win the competitor, then the story goes on from there. However, no date of been set, they would have to see if eachother's schedule fit.